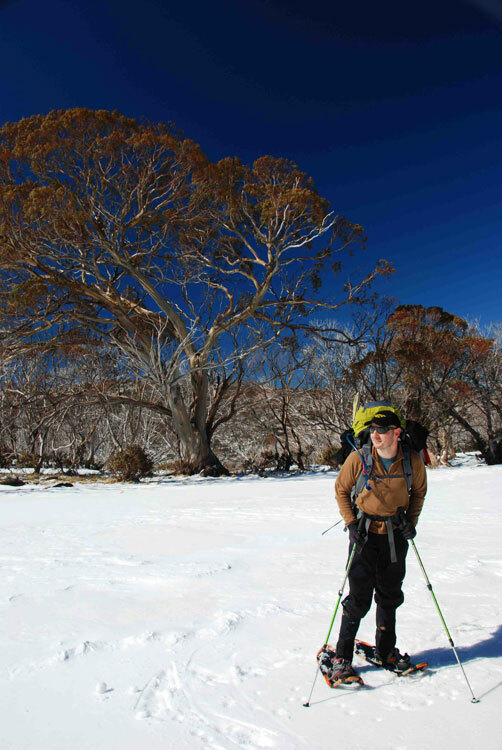 Ben Stubbs gets a lesson in survival while snowshoeing in the backcountry of Kosciuszko National Park. Although I have never wondered what it would be like to walk like a duck, I am now finding out as I trudge through the snow in Kosciuszko National Park. My snowshoes resemble tennis racquets with teeth, and they keep me upright as I waddle like Daffy to the top of the ridge. 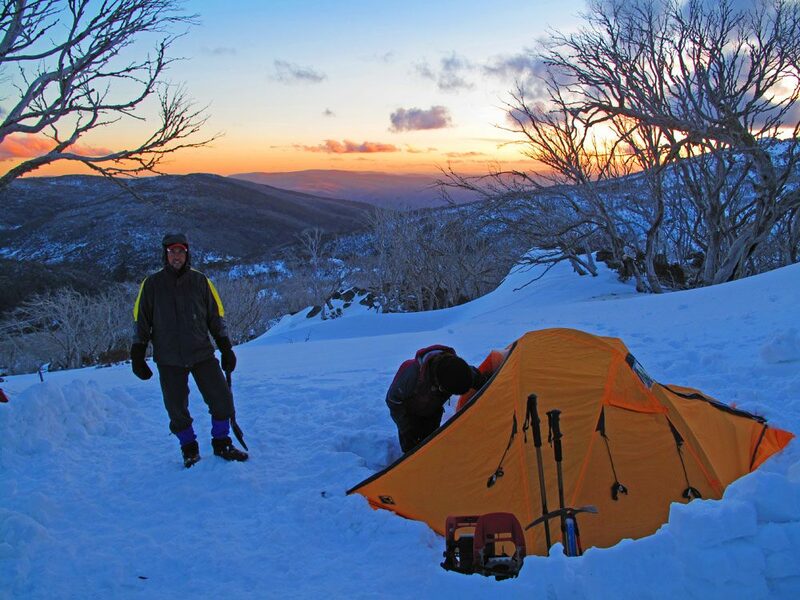 I’ve enrolled in a backcountry survival course in the NSW Snowy Mountains to allow me to experience something away from the crowds and lift lines in the resorts down the valley. 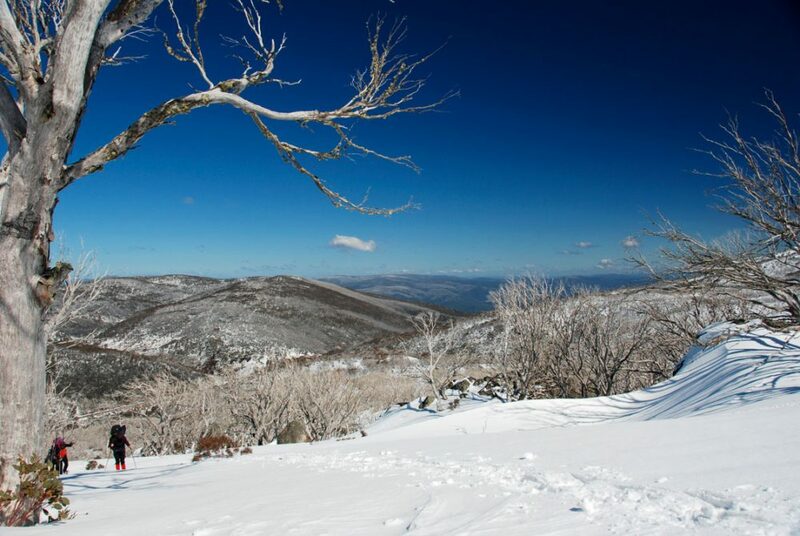 We begin at a kink in the Thredbo River and follow the tree line from Dead Horse Gap, 5km beyond Thredbo Village. 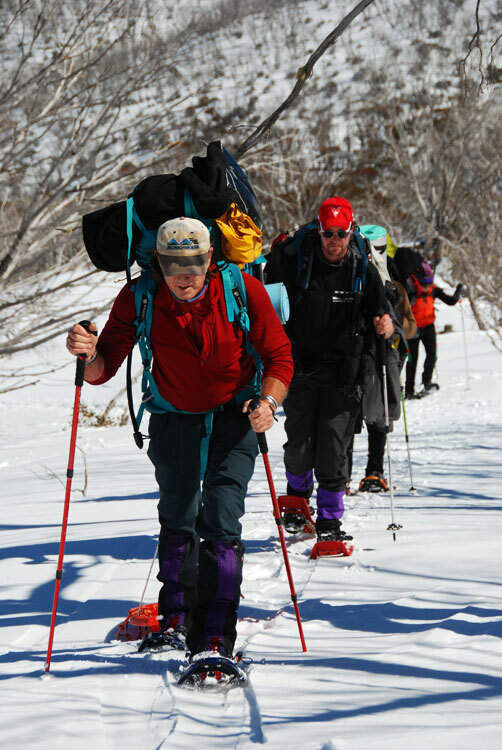 Chris Brown, of the Snowy Mountains Climbing School, is leading our expedition of six people who are looking for an alpine experience with a twist. Chris has the sort of bronzed skin that suggests he’s spent much of his life outdoors. As we chat on a break under the skeleton of a snow gum, a reminder of the 2003 bushfires, he tells me he has worked as a high-altitude mountain guide in Ecuador, Peru, Kazakhstan and Kyrgyzstan. At the crest of the rise we look out across the mountains of the Main Range; below are the headwaters of the Murray River, the Snowy River and, in the distance, the blue smudges of the Victorian Alps. I watch the mini snow tornadoes spin and lift off the top of Rams Head peak ahead of us as the afternoon gusts move in. Below South Rams Head we decide to set up camp for the evening. We are at 1800m and the wind slices straight through my jacket as I unclip my snowshoes. I’ve worked up a sweat on the 5km uphill trek, and Chris says the trick to staying warm isn’t to stand still and let the sweat dry; we should rug up immediately and trap the moisture to heat up again. Warmth and shelter are our most important priorities, so I volunteer to make a snow cave. 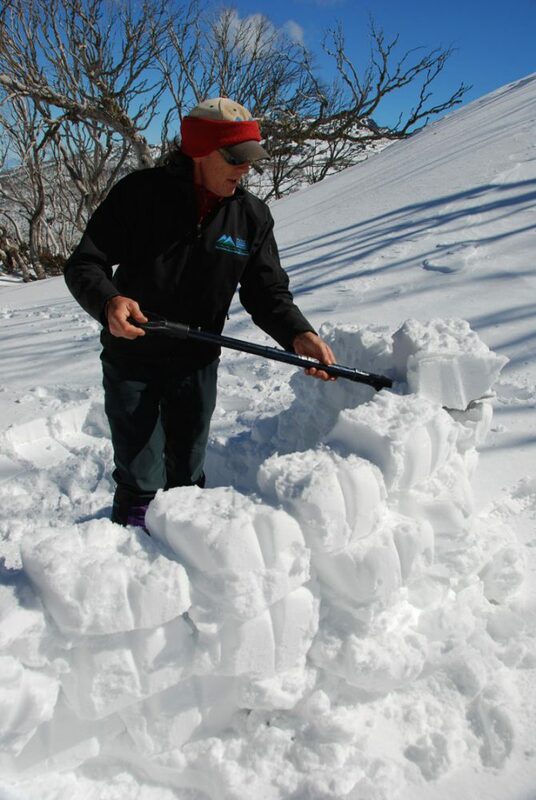 As I start shovelling the snow for my improvised shelter, Chris tells me that snow caves can easily collapse and should only be used as a last resort. I join the others, who are more sensibly building solid igloo walls around the tents to divert the wind, and a kitchen enclosure out of snow blocks. With our accommodation secure, Chris takes us to a ledge with a 40-degree drop to learn self-arrests, a survival technique used when you slip on a steep slope or an ice fall and have only your ice axe and boots to stop your descent. I push off the edge as if it were a slippery dip, instantly feeling the ice on my back. Snow flies up and under my clothes as I hurtle down the mountain. A clump of exposed rocks appears below. With only seconds to react, I grab my axe and thrust it into the ice above my left shoulder. It digs in and I swivel, kicking my boots into the snow until I stop. With a beard full of snow, I peer up at Chris, who gives me the thumbs up while the others applaud my effort. Chris says the technique has saved him three times in the past 25 years while on expeditions. The mood of the mountains changes as we finish our self-arrest exercises. Dark purple clouds percolate near Mt Kosciuszko and we take it as a hint to head inside. Sleet starts falling and the temperature plummets. If the weather doesn’t clear tomorrow, we’ll have to sit out the storm in our tents. This prompts discussion about the most important motto for mountaineers. Regardless of preparation and training, the weather is the master of the mountains. Chris lives by the slogan “hurry up and wait’’; cutting corners can mean the difference between life and death. As dawn breaks the next morning, the wind is roaring across the peaks; through the rocks I can see the curl of frozen rivers below. It’s too cold to stay still, so I venture out into the soup to warm up my frozen toes. The snow starts to fall heavily, building in clumps on the pink limbs of the snow gums. I see that the others are out exploring the trails and I follow their oversized footprints. In the haze of the morning mist my fellow trekkers don’t resemble alpine adventurers. With puffy coats and snowshoes attached they look like a set of six lost ducklings huddled together in a line, waiting for the weather to change. Dead Horse Gap is a five-minute drive beyond Thredbo. From Sydney, it is a six-hour drive along the Snowy Mountains Highway. 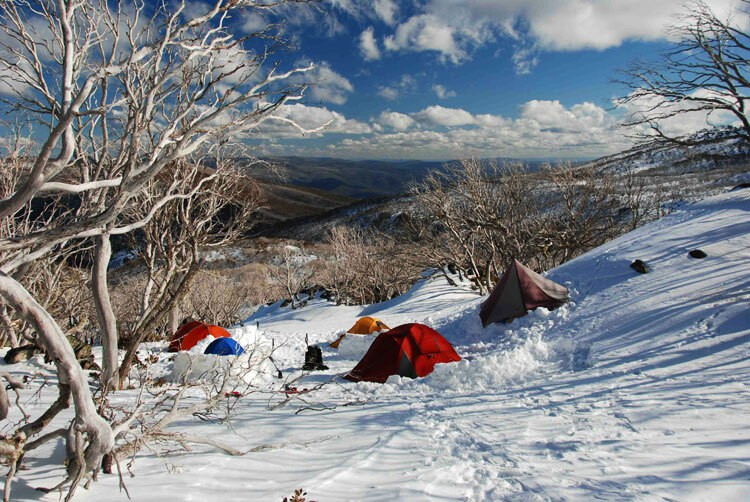 Snowy Mountains Climbing School runs a variety of snow adventure and survival courses during winter.